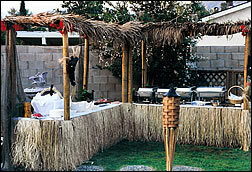 We also specialize in Hawaiian Luaus and Theme Parties. I lived in Hawaii for two years and have learned how to do the traditional luau. We do Luaus right!!! 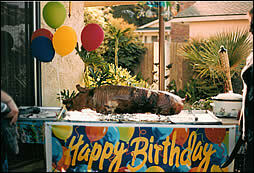 From a Kailua Pig in the ground or on a spit or just Kailua Pig Hawaiian style. We guarantee to tantalize your taste buds with this Hawaiian delight! We have many menus to choose from and Hawaiian props galore: Waterfalls, Cave Entrances, Volcanoes, Facades, Tiki Gods, Tiki Huts, Grass Skirts, Bamboo Fencing, Tiki Torches, Umbrellas, Authentic Thatching, Leis, etc. 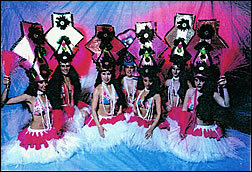 We can also provide you with traditional Hawaiian entertainment like Fire Dancers, Polynesian Dancers, Hawaiian Bands, etc. for a sunset night you will always remember. We also do Theme Parties of every kind: Mardi Gras, Country Western Ho-Downs, Renaissance Parties, Toga Parties, Holiday Parties, Era of the time, 30's, 40's, 50's, 60's, 70's, 80's, etc. You name it! We'll build it and they will come! "We serve any kind of ethnic food on the globe" and we will even cook your own recipes. "CALL FOR YOUR SPECIAL DISCOUNTED PRICE"
"Aloha from EMPIRE CATERERS and EVENT PLANNERS"
Call for a free consultation and references.